Apium (including celery and the marshworts) is a genus of about 20 species of flowering plants in the family Apiaceae, with a subcosmopolitan distribution in Europe, Asia, Africa, South America and Australia. They are medium to tall biennials or perennials growing up to 1 m high in the wet soil of marshes and salt marshes, and have pinnate to bipinnate leaves and small white flowers in compound umbels. Some species are edible, notably Apium graveolens, which includes the commercially important vegetables celery, celeriac and Chinese celery. Apium bermejoi from the island of Menorca is one of the rarest plants in Europe, with fewer than 100 individuals left. The genus is the type genus of the family Apiaceae and the order Apiales. 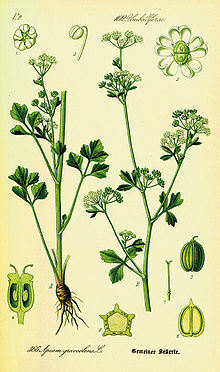 Apium species, including garden celery, are eaten by the larvae of some Lepidoptera species including angle shades, common swift, Hypercompe icasia, the nutmeg, setaceous Hebrew character and turnip moth. ^ IUCN Red List: Apium bermejo. '^ "' Apium annuum". FloraBase. Western Australian Government Department of Parks and Wildlife. ^ "Apium graveolens". FloraBase. Western Australian Government Department of Parks and Wildlife. ^ "Apium insulare". Australian Plant Name Index (APNI), IBIS database. Centre for Plant Biodiversity Research, Australian Government, Canberra. Retrieved 2009-10-05. ^ "Apium prostratum". FloraBase. Western Australian Government Department of Parks and Wildlife. This page was last edited on 13 January 2019, at 00:39 (UTC).